The controversy over the proposed bifurcation of Eastern Railway has now turned out to be a fight between “Mamata and Samata” with both Railway Minister Nitish Kumar and Trinamool Congress leader Mamata Banerjee sticking to diametrically opposite stands. Newly appointed Minister of State for Defence Production Chaman Lal Gupta today favoured the holding of the coming Assembly elections in Jammu and Kashmir under the Governor’s rule. The BJP today asserted that though the proposed Gaurav Yatra in Gujarat was a legitimate political activity, it had been called off because the party felt that it should not give “unnecessary handle to opponents to exploit the situation “ when restoration of peace and normalcy was its first priority. 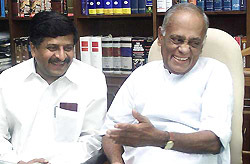 Former BJP President K. Jana Krishnamurthy today denied that he was ever reluctant to quit the post of party chief. “I was never reluctant to quit the post but never wanted to accept the new responsibility,” Mr Krishnamurthy, who assumed office as the Law Minister, told reporters here. Film star-turned-politician Vinod Khanna, who assumed office here today as the Minister of State for Tourism and Culture, said one of his priorities would be to promote tourism in Punjab. Expressing happiness over private sector showing interest in development of infrastructure in the country, Union Minister of State for Road Transport and Highways B.C. Khanduri said the Vajpayee government’s endeavour would be to involve private partners in a big way in development of road infrastructure. Union Food and Consumer Affairs Minister Sharad Yadav said today that there were differences between him and the Finance Minister Yashwant Sinha over issues such as labour reforms and Employees’ Provident Fund and observed that his party Janata Dal (U) was “under-represented” in the Union Council of Ministers. The Congress today appointed Mr Arun Kumar Singh Munna as President of the Pradesh Congress Committee in Uttar Pradesh. India's Anti-Corruption Bureau unearths appointment scam by the Maharashtra State Public Service Commission. The father of India's missile programme and NDA's presidential nominee, Dr APJ Abdul Kalam, is also the inventor of the country's first coronary stent. 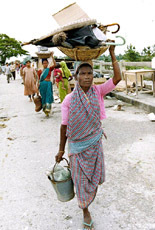 Floods wash away parts of the national highway and damages a railway bridge in Jalpaigur district of West Bengal. Indians are trying their hands at international cuisine like Thailand, Mexico, Lebanon and so on. Lets take a look. While Ms Banerjee has demanded that the proposal be dropped in the interests of Bengal, Mr Nitish Kumar has reiterated that the decision would be implemented to facilitate the formation of East-Central Railway with its headquarters at Hajipur. Mr Nitish Kumar pleaded that the decision had been taken by his predecessor, Mr Ram Vilas Paswan, and was endorsed by the Union Cabinet. Meanwhile, Samata Party workers and supporters burnt Ms Banerjee’s effigies at several places in Bihar and threatened to launch an agitation demanding the formation of the railway with its headquarters at Hajipur. They also threatened to block rail traffic between Bengal and Bihar if the Trinamool Congress stood in the way of the formation of the railway at Hajipur. On the other hand, Ms Banerjee, now in the Capital, directed her party leaders to be ready to launch a massive agitation including calling a Bangla bandh, against the bifurcation of Eastern Railway. She said the decision was politically motivated to serve vested interests. 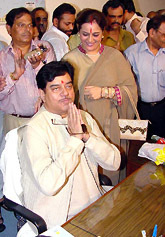 Mr Subrata Mukherjee, Kolkata Mayor, who accompanied Ms Banerjee to a meeting with the Prime Minister yesterday, returned to the city today with the impression that Ms Banerjee would get the Coal and Mines portfolio as a Cabinet Minister and the issue of the bifurcation of Eastern Railway would be solved amicably. He said the issue would be kept in abeyance and a committee set up to examine the matter. West Bengal Chief Minister Buddhadeb Bhattacharyya sent another letter to Mr Vajpayee and the Railway Minister, requesting them to withdraw the decision. Mr Anil Biswas of the CPM said the party would welcome Ms Banerjee’s fight against the bifurcation move but would not join the Trinamool Congress’ agitation. He said the workers of CPM and other political parties would launch an agitation separately against the move. BJP minister from Bengal, Mr Tapan Sikhdar, and Mr A.B.A Ghani Khan Chowdhury, a former Railway Minister, said they would request Mr Nitish Kumar to re-examine the proposal and then take appropriate steps. Questioning Chief Minister Farooq Abdullah’s objection to it, Mr Gupta, after assuming the office, said: “When all parties are demanding that the state should be placed under the Governor’s rule, why should he (Dr Abdullah) have any objection, especially since he claims that he had got a two-third majority in the 1996 election when they were conducted under the Governor’s rule”. Referring to Prime Minister Atal Behari Vajpayee’s recent statement in Lucknow that the Centre was considering the imposition of Governor’s rule in the state for conducting elections he said: “the Centre is committed to holding a free and fair poll in the state and everything should be done to achieve this objective”. Mr Gupta disclosed that the Centre had constituted a Civil-Army Combined Committee for deciding the compensation to be paid to the farmers whose lands were taken over by the armed forces due to the deployment on the border. The committee was expected to submit its report by July 8 after which compensation would be paid to the farmers. In this connection, he pointed out that the committee was constituted due to claims and counter-claims being made by the civilian and Army authorities on the quantum of the land taken over by the armed forces due to the border deployment. Addressing mediapersons, BJP spokesman Arun Jaitley said the decision to postpone the yatra was taken collectively by the state and Central leadership of the party after going into the pros and cons of the yatra which was slated to begin from July 4. The yatra was a “positive political campaign for restoring the prestige and dignity of the state, particularly after a campaign of calumny had been carried against it”. “The NHRC made some observations about the yatras and the Gujarat unit of the BJP consulted the national leadership and was of the view that the yatra was a political campaign. However, we felt that we should not give unnecessary handle to opponents when restoration of peace and normalcy in Gujarat was the top-most priority,” Mr Jaitley said. The National Human Rights Commission had expressed serious concern that the proposed Gaurav Yatra and Jagananth Rath Yatra could re-ignite communal violence in the riot-hit Gujarat. “The BJP Gujarat unit is a responsible party and took into account all these factors (NHRC’s observations) into consideration while taking the decision,” he said. Former BJP President K. Jana Krishnamurthy today denied that he was ever reluctant to quit the post of party chief. “I was never reluctant to quit the post but never wanted to accept the new responsibility,” Mr Krishnamurthy, who assumed office as the Law Minister, told reporters here. The 72-year-old RSS pracharak-turned-politician said “destiny” made him the Law Minister. “Destiny plays its role... If I am able to do something to uphold the majesty of law in social life, I will think I have succeeded in the task entrusted to me,” he said. Minister of State for Law Ravi Shanker Prasad, who was practising in the Patna High Court as senior advocate, also assumed office along with Mr Krishnamurthy. On the shifting of the Department of Company Affairs from his ministry to the Ministry of Finance, Mr Krishnamurthy said this was a purely administrative arrangement and nothing should be read into it. “Company Law is with me,” he quipped. Both Mr Krishnamurthy and Mr Prasad said outgoing minister Arun Jaitley had done a lot in the field of judicial reforms and to speed up the justice delivery system. Agreeing that not much had been done to promote tourism in Punjab, the newly appointed minister said tourism as a whole had to be promoted as an industry. He said although there were a number of tourism spots in Punjab which could be promoted, not much attention had been paid to them. He said the tourism industry had still performed well despite all odds, with only a 17 per cent drop in tourist arrivals. Mr Khanna said he would also do whatever possible to promote tourism in Jammu and Kashmir, which has been severely hit by terrorism. He said new packages for Kulu, Manali and other tourist destinations would be designed. “Innovative schemes are being devised to attract private investment into the road sector,” Mr Khanduri said while inaugurating the phase II of the Moradabad bypass on the NH-24 last evening. The Moradabad bypass project has been implemented by the Highways Authority of India (NHAI) through an innovative financing mechanism by incorporating the Moradabad Toll Road Company Limited. The total cost of the project is Rs 103.50 crore, out of which Rs 31.05 crore is the share capital and Rs 72.45 crore has been raised through long-term loans. “As Labour Minister, I had differences with some of my colleagues, particularly Finance Minister, over issues like labour reforms and interest rate on Employees’ Provident Fund,” he said after taking charge as the Food Minister today. He said differences with his ministerial colleagues were on some finer details and were on the verge of being sorted out when the reshuffle of portfolios took place. A two-time minister in UP who was also an office-bearer of the Youth Congress, Mr Munna has worked both with Indira Gandhi and Rajiv Gandhi. Hailing from Jaunpur, Mr Munna also served as deputy leader of the Congress Legislature Party in UP. He was also in the Congress (Tiwari). The appointment of Mr Munna as PCC chief comes at a time when the high command is making hectic efforts to revive the Congress in UP. Meanwhile, the Congress today expressed relief that the rath yatra of Gujarat Chief Minister Narendra Modi has been stopped in its tracks. 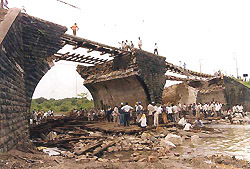 The Palghar-Bhoisar bridge, which connects Mumbai to northern India is under construction after it collapsed due to heavy rain in the state, disrupting rail traffic.